Check out our other items. Nissan Primera WP11 P11 Infiniti G20 Front suspension bush kit. Nissan Primera Primera P11 96-02. Nissan Primera Primera WP11 98-02. 1x 281230B : Anti roll bar link bush. 2x 281564B : Front lower arm front bush. 2x 281565B : Front lower arm rear bush. 2x 281566A : Front upper arm bush SPORT. 2x 281567A : Front upper arm bush SPORT. 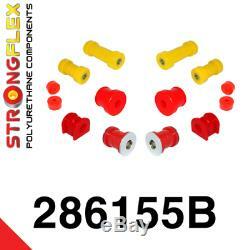 2x 281582B : Front anti roll bar bush. UPPER ARM BUSH FRONT LOWER ARM REAR BUSH. RED color - hardness of about 80 ShA - suspension components have a hardness similar to the original metal-rubber bushes. However, strength of the polyurethane is many times greater, and the unique properties ensure long lasting comfort. We recommend RED products for all "daily use" car users who want improve stability and better driving. YELLOW color - hardness of about 90 ShA - recommended for racing, sports, tuned cars. The suspension is much stiffer, as at higher speeds is important. Durability ensures stability of polyurethane suspension for many years. We provide 2 years guarantee (24 months) for all products. The item "Nissan Primera WP11 P11 Infiniti G20 Front suspension bush kit" is in sale since Thursday, November 16, 2017. This item is in the category "Vehicle Parts & Accessories\Car Tuning & Styling\Performance Suspension\Other Performance Suspension".eu" and is located in Wroclaw. This item can be shipped to United Kingdom.